Justin A. Cohn | The Journal Gazette Komets forward Taylor Crunk, second from right, has checked the Rapid City Rush's Brandon Fehd to the ice on Saturday, and goaltender Tyler Parks and Pierre-Luc Mercier look on at Memorial Coliseum. Justin A. Cohn | The Journal Gazette Komets defenseman Cody Sol, middle, stands up Rapid City's Matt Harrington in the defensive zone at Memorial Coliseum on Saturday so Kevin Gibson, left, can chase the puck in the corner. Justin A. Cohn | The Journal Gazette Taylor Crunk of the Komets, right, chases the puck at Memorial Coliseum on Saturday. The Komets had a sizable crowd and a sizable amount of chances, but they came away with only one point for the standings. Despite outshooting the Rapid City Rush 51-28, they emerged with a 2-1 loss in an overtime shootout tonight. J.C. Campagna had the only goal of the shootout, while Rapid City got tallies from Justin Faryna and Pierre-Luc Mercier. Fort Wayne outshot Rapid City 44-25 in regulation time. 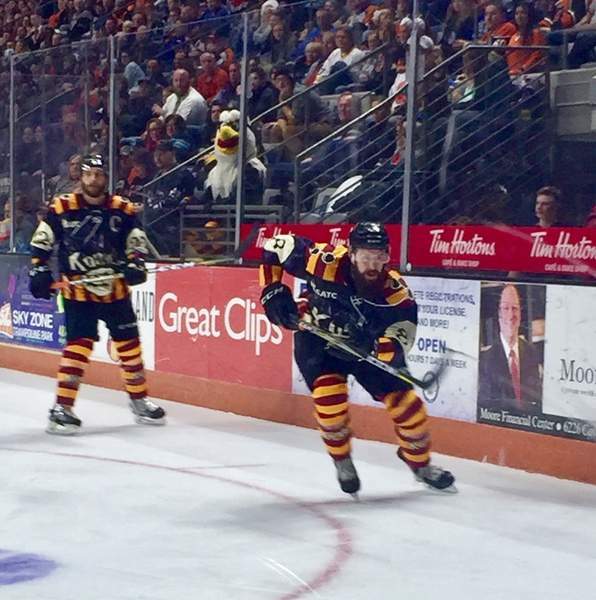 A sellout crowd of 10,479 – the first one of the season – attended the game at Memorial Coliseum for the first Harry Potter Night, as the Komets wore special jerseys that were auctioned to benefit the Fort Wayne Sexual Assault Treatment Center. Captain Jamie Schaafsma’s jersey sold for the most, $2,333, followed by Shawn Szydlowski’s ($1,667), Cody Sol’s ($1,800) and Campagna’s ($1,107). The Komets’ lineup was bolstered by the return of Jake Kamrass, who had missed four games with an upper-body injury, and Campagna, who had been called to Chicago of the American Hockey League to play a game Friday night in which he was scoreless. They remained without their all-star forward, Justin Hodgman (hand), who missed an eighth straight game, and Jordan Sims (hip), and they scratched Oskari Halme and new acquisitions Garrett Clarke, Guillaume Naud and Quintin Lisoway. Fort Wayne’s Marco Roy opened the scoring 13:58 into the first period, snapping a shot from 30 feet out past goaltender Tyler Parks, after Anthony Petruzzelli set Roy up with a pass from the outside of the right circle. Parks was busy, as Fort Wayne tallied 24 of the first 34 shots and maintained its 1-0 lead through two periods even as the Komets’ Taylor Crunk engaged in a second-period fight with Richard Coyne, who had upended him behind Parks. Coyne tied it at 1 with a shot from the right circle 6:48 into the third period. The Komets thought they had regained the advantage at 15:13, when Roy redirected a Brady Shaw pass toward the top corner, but video replay, something the ECHL doesn’t utilize to review goal calls in 23 of its 27 arenas, showed the puck appeared to carom off the crossbar. 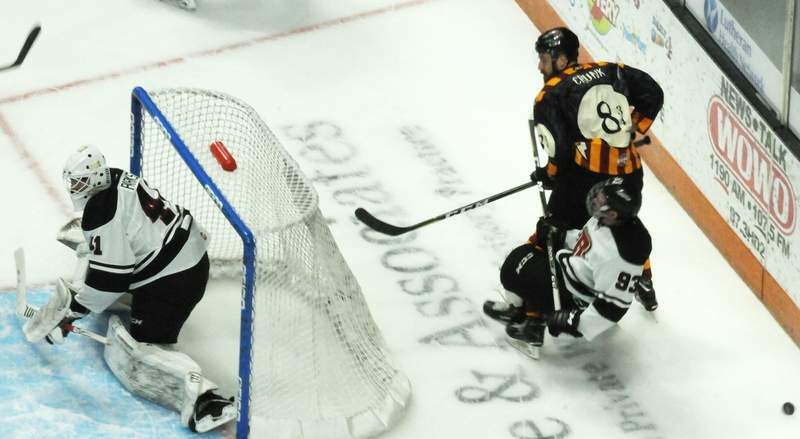 While the Komets dominated the 3-on-3 overtime, tallying eight of the 10 shots on goal, Fort Wayne goaltender Eric Levine had the biggest stop, thwarting Darby Llewellyn on a late breakaway. The Komets next travel to St. John’s, Newfoundland, to play the Growlers on Friday, Saturday and Sunday. Notes: The referee was Jacob Rekucki. … Both teams were 0 for 5 on power plays. … The Komets don’t play at the Coliseum again until Feb. 15, when they play host to the Adirondack Thunder. … The Komets came in to the night leading the ECHL in average attendance at 7,828.